Less than a month after opening, Frances nailed it. This particular dish was actually the first I had ever ordered way back in January, and the memory of it stuck with me for the entire year. 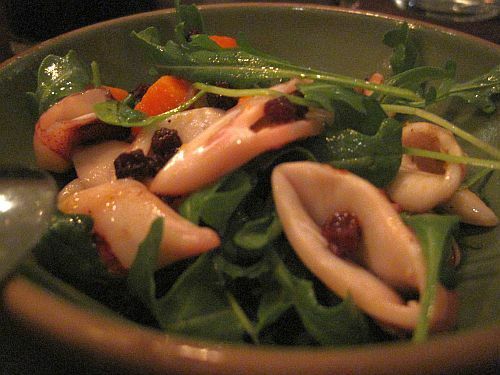 With only 5 ingredients (squid, Rugosa squash, preserved lemon, currants, arugula), to me this dish represents the type of food served at this restaurant: uncomplicated, seasonal, well-executed, and incredibly flavorful. I was happy to see grilled calamari served without cannellini beans and capers, and Perello’s unique combination of ingredients was particularly thoughtful. The squash mirrored the texture of that type of bean but provided an extra layer of sweetness, while the preserved lemon almost functioned as a caper substitute, adding both acidity to the calamari and tartness to balance the squash. The play between sweet and tart was also found in the tiny currants, making it so that with every bite layers of sweet-sour-salty flavor unfolded in your mouth. Although I tried other incarnations of this dish (which varied with the season), this particular composition was the most impressive. 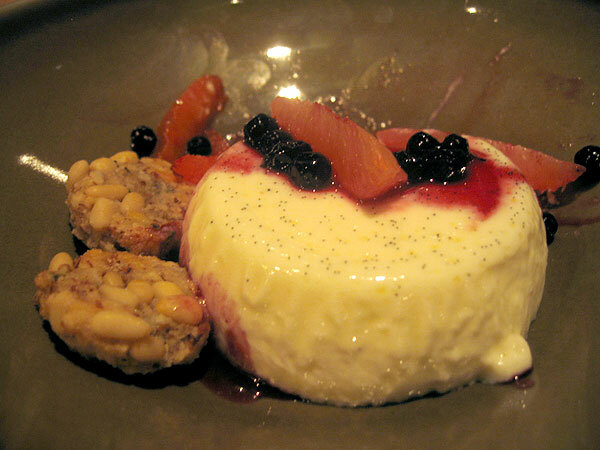 You can read about all the other dishes from that night at Frances here. When I walked into Frances, I wasn’t sure if I had entered a restaurant, or a room in my friend’s upper-middle class, suburban home. Cream walls, walnut tables, black-and-white stock-art – if Restoration Hardware died and came back as a restaurant, this would be it.